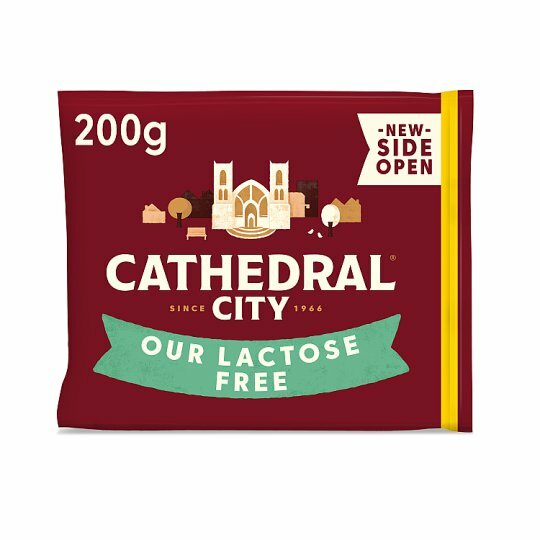 Cathedral City Lactose Free Mature Cheddar* - smooth and mellow, a timeless classic. * Less than 0.01% lactose. All cheddar is naturally low in lactose, but we test every batch of our Lactose Free Cheddar to guarantee it's lactose free. So whether you're lactose intolerant or it's simply a lifestyle choice, you can still enjoy the great taste of Cathedral City. Established in 1966. By Appointment to Her Majesty The Queen Suppliers of Dairy Products Dairy Crest Limited, Surrey. Red Tractor Assured. Keep refrigerated below 5°C., To enjoy this product at its best, consume within 7 days of opening.